Google Maps for iOS has been updated this morning and with it brings one of the most anticipated updates: Google Maps support for Apple CarPlay. 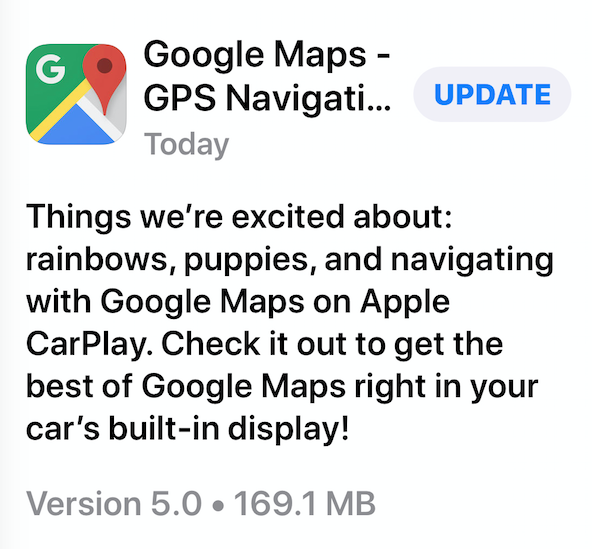 Things we’re excited about: rainbows, puppies, and navigating with Google Maps on Apple CarPlay. Check it out to get the best of Google Maps right in your car’s built-in display! Apple first announced it would bring third-party maps support for Apple CarPlay back at WWDC with iOS 12. With the release of iOS 12 yesterday, Google Maps is the first third-party navigation app to release an update to support CarPlay. Google’s other navigation app, Waze, is currently testing its CarPlay version in beta. On the weekend, first images of Google Maps within CarPlay were shared by a beta tester, hinting a public launch would be coming soon. How to install Google Maps within Apple CarPlay? First, download to the latest version of Google Maps from the App Store and you’ve been updated to iOS 12. Then, on your iPhone, go to Settings > General > CarPlay > tap your car’s name. From here, you’ll see your vehicle’s CarPlay home screen. Just tap the “+” next to Google Maps in the app list and you’ll see it installed into CarPlay in your vehicle. Click here to download Google Maps (version 5.0) for iOS in the App Store, and install the CarPlay update into your vehicle. Let us know how you like it.